The Eureka EasyClean Corded Hand-Held Vacuum is a convenient and powerful cleaning device that can make it easier to keep your home clean. Small and lightweight, it provides an alternative to bulky and heavy vacuum cleaners that are difficult to carry around. This makes it not only easy to use, but also convenient to store and to travel with. In this review we’ll be exploring some of the features of this vacuum cleaner, identify the major pros and cons and decide whether or not it offers good value to consumers. The EasyClean has a number of useful features. Lightweight and Convenient -Weighs 5 pounds and comes with a 20 foot cord that wraps up for storage. This makes the device easy to store and carry around. Two Motors -One motor powers the cleaning brush while the other is for suction. No Bags to Change -The vacuum has a washable dust-cup that can be emptied out easily. You simply flip a switch to the “open cup” position to clean the cup. 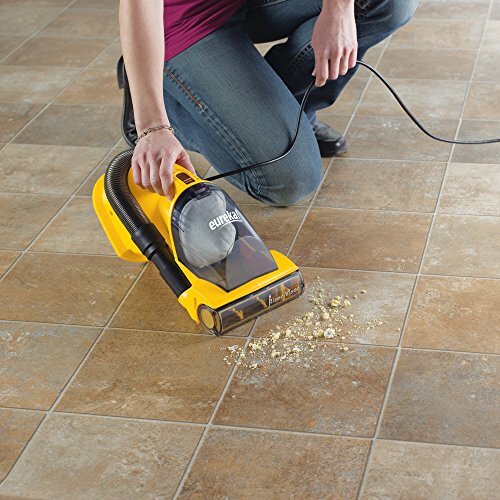 5.5 Amp Power -Provides powerful suction to pick up deeply embedded dust and debris. Stretch Hose -Makes it easy to vacuum cars, stairs and difficult to reach spaces. The 20-foot gives you ample reach. Riser Visor Nozzle -For cleaning stairs and upholstery in either a horizontal or vertical motion. Crevice Tool -Allows you to reach spaces that are too small to reach with the brush. The Eureka hand-held is a powerful and versatile vacuum that can be used to clean carpets, cars, stairs, upholstered furniture and other spaces around the home or office. There are quite a few advantages to this vacuum cleaner. It’s far more user friendly and lightweight than traditional vacuums, which are heavy and require you to change bags. The Eureka is quite powerful for its size. It’s small enough to take with you if you want to bring it to your office, vacation home or anywhere else that needs cleaning. The 20-foot cord makes it easy to cover a great deal of space, whether you’re cleaning the carpet, furniture, staircases or a vehicle. The suction is surprisingly powerful, allowing you to pick up stubborn debris such as pet hair. The crevice tool and riser visor nozzle allow you several choices for cleaning different types of surfaces. One of the most useful features of this vacuum is that it’s powerful enough to remove most pet hair from carpets and furniture. As pet owners know, many vacuums are not very effective in this way. This vacuum is also economical. With many tratdional vacuum cleaners costing hundreds of dollars, this one is quite a good buy considering what a useful cleaning tool it is. The EasyClean Corded Hand-Held Vacuum is very useful for covering a lot of space and reaching difficult spaces. 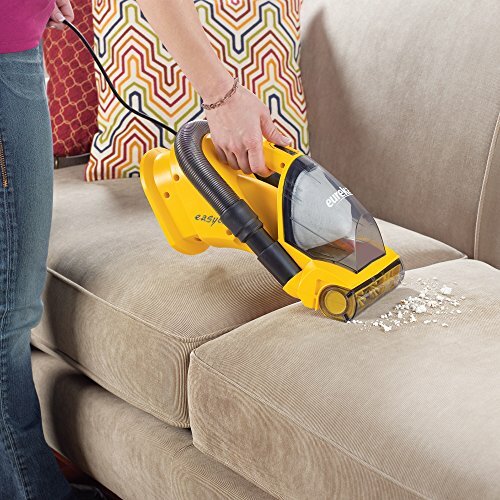 However, if you need to clean a large carpet, it can get a little tedious using a hand-held vacuum. For some jobs, it’s easier to push around a larger vacuum. The Eureka EasyClean is more suitable for smaller and average sized spaces rather than very large rooms. The powerful suction is an advantage, but it also represents a potential problem if you’re not careful. You have to be careful not to vacuum up anything that could be damaged or that could damage the motor. While the sound of this vacuum is not deafening, it’s not an especially quiet model either. Overall, the EasyClean Vacuum offers excellent value for the price. For anyone tired of lugging around large and bulky vacuum cleaners, this model represents a welcome alternative at a good price. While not ideal for covering very large carpets, it’s perfect for the average home or apartment. For a vacuum cleaner that sells with a budget price tag, it would be hard to find better value than the Eureka Hand-Held Vacuum.